Whey Protein Blend (Whey Protein Isolate, Whey Protein Concentrate, Whey Protein Hydrolysate), Cocoa, Natural and Artificial Flavors, Salt, Xanthan Gum, Sucralose, Essential Fatty Acid Matrix (Medium Chain Triglycerides, Conjugated Linoleic Acid, Silicon Dioxide), Digestive Enzyme Complex (Glycoamylase, Amylase, Lipase, Protease, Papain, Hemicellulase, Cellulase, Lactase). Whey Protein Blend (Whey Protein Isolate, Whey Protein Concentrate, Whey Protein Hydrolysate), Natural and Artificial Flavors, Cookie Pieces (Unbleached Unenriched Wheat Flour, Sugar, Palm and Palm Kernel Oil, Cocoa, Chocolate Liquor, Sodium Bicarbonate, Soy Lecithin), Salt, Xanthan Gum, Sucralose, Essential Fatty Acid Matrix (Medium Chain Triglycerides, Conjugated Linoleic Acid), Digestive Enzyme Complex (Glycoamylase, Amylase, Lipase, Protease, Papain, Hemicellulase, Cellulase, Lactase). Whey Protein Blend (Whey Protein Isolate, Whey Protein Concentrate, Whey Protein Hydrolysate), Natural and Artificial Flavors, Cocoa, Salt, Xanthan Gum, Sucralose, Essential Fatty Acid Matrix (Medium Chain Triglycerides, Conjugated Linoleic Acid), Digestive Enzyme Complex (Glycoamylase, Amylase, Lipase, Protease, Papain, Hemicellulase, Cellulase, Lactase). 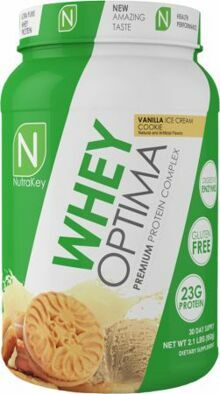 Whey Protein Blend (Whey Protein Isolate, Whey Protein Concentrate, Whey Protein Hydrolysate), Natural and Artificial Flavors, Salt, Xanthan Gum, Sucralose, Essential Fatty Acid Matrix (Medium Chain Triglycerides, Conjugated Linoleic Acid), Digestive Enzyme Complex (Glycoamylase, Amylase, Lipase, Protease, Papain, Hemicellulase, Cellulase, Lactase). We absolutely loved the salted caramel peanut butter cup flavor!